West Athletes commit to athletic careers beyond high school. On Wed. Apr. 11 Niles West held April’s National Signing Day at 7:30 A.M. in the student commons. 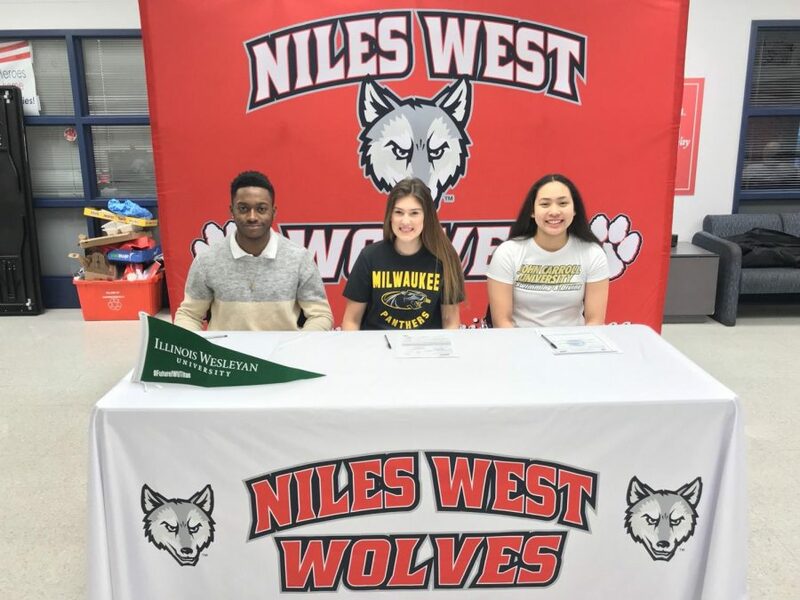 Three student-athletes, senior Shawn Campbell, senior Katelin Avenir, and senior Mia Piljevic decided to further their academic and athletic careers at a collegiate level. Avenir started competitively swimming when she was nine years old and just committed to John Carroll University to continue her swimming career. “I am beyond excited to start a new chapter of my athletic and academic career at John Carroll, but am also a little nervous at the same time. Placing myself in an environment that is completely new to me can be overwhelming, but I know John Carroll will make me feel right at home. I can’t wait to see what the next four years will bring,” Avenir said. Avenir recognizes the privilege of competing at a collegiate level and is looking forward to what the future holds. Avenir and Piljevic’s coach, Jason Macejak, knew that both of the girls were going to be stars right when they joined the swimming team. “When I first met [Avenir and Piljevic], I knew that they would be competing all four years here at West, and probably even at the collegiate level. You know, some people swim because they like it, and others do it because it’s in their blood. That’s the case for these two girls. The swim ten, eleven months of the year, and they get to continue their journey,” Macejak said. Macejak is incredibly proud of the legacy that the girls are leaving once they graduate. He knows that they have made quite the mark here at West and that the other swimmers look up to them very much. Campbell committed to Illinois Wesleyan and is extremely proud that he can take his game to the next level. He is excited to be able to do his school work while still being able to play. Campbell has plans to hopefully some day transfer to a Division I school to play football. “I would really like to transfer schools at some point, hopefully, a Division I school. If I plan to be an engineer who works in the environment, I would like to get my degree from a D1 program, and hopefully get to play football at the same time,” said Campbell. Best of luck to the athletes as they continue their athletic careers.